Preserve the rural character of the Gaviota Coast and where appropriate, encourage regenerative agriculture. Agriculture is the bedrock of our coastal heritage. We encourage agricultural practices that build soil, manage water wisely, avoid toxic chemicals and support biological resources. Restore and enhance the ecological integrity of the Gaviota Coast, its whole and undivided natural character. Support policies and practices that promote and revitalize biological diversity. Encourage appropriate and respectful public use and access. Recreation and rejuvenation are personal and community benefits. People that experience their environment become more active stewards of their homeland. Join the Gaviota Coast volunteers as we show our Mother love by cleaning up a heavily used Gaviota Coast beach. We'll also get to enjoy one of the last weekend low tides of the year! Bring your mom, wear sturdy shoes, and bring gloves - we'll provide reusable bags! 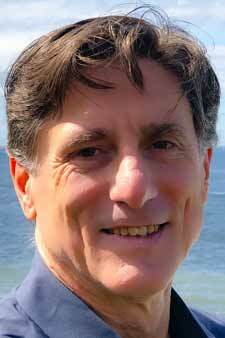 Gaviota Coast Conservancy (GCC) has hired environmentalist Doug Kern (seen here in a recent photo) to serve as the organization’s first executive director. He will begin his post on May 1. The GCC Board of Directors completed an extensive search to find the right leader to help grow the organization’s capacity and advance its mission of protecting and preserving the unique and precious Gaviota Coast in Santa Barbara County. As director of conservation for the Mendocino Land Trust, Doug Kern successfully completed more than a dozen endangered coho salmon recovery projects. He helped conserve old-growth redwoods and agricultural lands through conservation easements and managed Land Trust properties to improve public access. Kern's work on climate change includes establishing the first public electric vehicle-charging station network in Mendocino County. Prior to his five years at the Mendocino Land Trust, Kern served as executive director of the Urban Watershed Project in the Presidio of San Francisco for 16 years. He also led the Presidio Restoration Advisory Board, where he organized community input and restored natural stream ecosystems from contaminated lands. Kern received his undergraduate degree from UC Berkeley in geophysics and later returned to school to earn an MBA from Cornell University. He is a trained mediator with experience resolving complex, multi-party land use issues. “Doug brings extensive skills, experience and knowledge to our organization that will allow Gaviota Coast Conservancy to strategically pursue the preservation opportunities that are developing on the coast." said Steve Forsell, Gaviota Coast Conservancy president. "He is collaborative and energetic. We are thrilled to have engaged his service,” Forsell said. “I look forward to working with all of the GCC’s many partners and the community to protect our coastal heritage for the benefit of the plants, the critters, the local residents and future generations,” Kern said. Founded in 1996, Gaviota Coast Conservancy is devoted exclusively to protecting and enhancing the rural character and ecological integrity of the Gaviota Coast for the benefit and enjoyment of present and future generations. Here's this media release as published in the Santa Barbara Independent and Noozhawk. Thanks to these outlets for sharing our great news.